Ayur&apos; means &apos;Life&apos; and &apos;Veda&apos; means &apos;Science&apos;. Thus Ayurveda is the &apos;Science of Life&apos;. In Ayurveda, health is a state of spiritual and physical attainment. It is a medical, metaphysical healing life science - the mother of all healing arts. 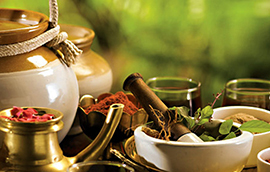 The practice of ayurveda is designed to promote human happiness, health and creative growth. The philosophy of Ayurveda believes that everything in this Universe is composed of five elements, the panchbhootas. They, in turn, constitute the three doshas or bio-energetic forces that govern our health and determine our constitution. The trigunas or psychic forces determine our mental and spiritual health. Ayurveda teaches us to balance all these to live a healthy, happy and contented life.